10x5 JXF Wooden Propeller made from German Beechwood finished to a high standard.Machined usin..
10x7 JXF Wooden Propeller made from German Beechwood finished to a high standard.Machined usin..
11x7 JXF Wooden Propeller made from German Beechwood finished to a high standard.Machined usin..
11x4 JXF Wooden Propeller made from German Beechwood finished to a high standard. Machined using a CNC machine then manually finished by hand. 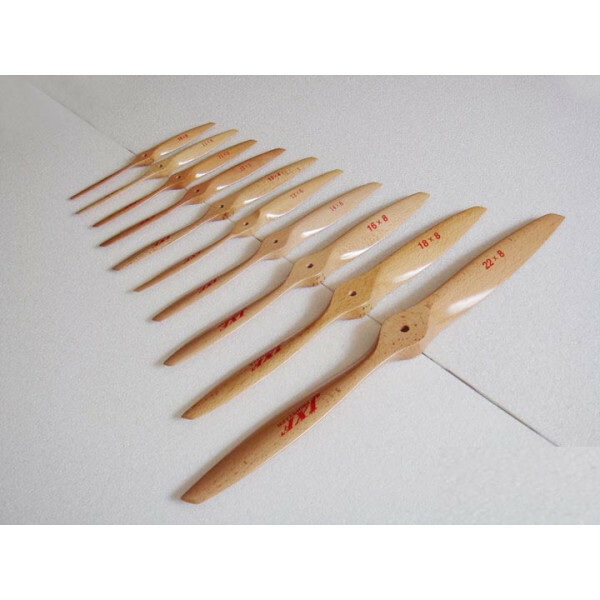 Each blade of JXF propeller is machined accurately in weight, blade angle, blade area, length and shape to maintain excellent static and dynamic balance and minimize the vibration. During the material selection, machining and quality check procedure, every JXF propeller must undertakes the static and dynamic test in tension and anti-deformation including the excess revolution test. Thus, every JXF propeller has a good rigidity and strength to ensure their safety. Frsky TFR4 FASST Reciever FrSky TFR4 4ch 2.4Ghz Surface/Air Receiver FASST CompatibleFeatures:C..